There are two relegation six-pointers in the English Premier League this weekend and the home teams, Fulham and Cardiff, stand out as the best value match bets on the program. Both Fulham and Cardiff have recorded three English Premier League wins out of 10 home games and they welcome opponents in Sunderland and West Ham respectively that have won only once on the road in the top flight this term. However, the raw statistics do not do justice to Fulham and Cardiff. Fulham may occupy 16th spot on the English Premier League ladder but the Cottagers are winning the matches that matter most to them. People say that relegation candidates such as Fulham must take points from its games against sides that are fighting for their lives as well. Fulham has played 10 matches versus bottom-half teams for six wins, one draw and three losses. Also, Fulham has won each of its last two winnable home games, beating Aston Villa 2-0 and defeating West Ham 2-1. Fulham is not a world beater by any stretch of one’s imagination but the Cottagers are overpriced at odds of 2.25 with William Hill, to vanquish Sunderland. Like Fulham has improved for getting rid of Martin Jol, so has Sunderland for waving goodbye to Paolo Di Canio. But Sunderland is bottom of the English Premier League ladder for a reason and the record of the Black Cats against sides below halfway is appalling. Sunderland has played 10 such matches for zero wins, four draws and six losses, with the Black Cats conceding 16 goals and replying with just three. Fulham will have had a full week to prepare for what is one of its most important games of the season so far, whereas Sunderland will arrive at Craven Cottage having played a hard English Capital One Cup semi-final first leg versus Manchester United at the Stadium of Light on Tuesday. Ole Gunnar Solskjaer has lifted the mood at Cardiff and the Bluebirds, fresh from eliminating Newcastle from the English FA Cup at St James’s Park, are worth supporting at odds of 2.15 with Sky Bet to deepen West Ham’s gloom considerably. The English Premier League fixture computer has not been very kind to Cardiff, hence why one ought to forgive the Bluebirds for winning three, drawing three and losing four of their 10 home matches. Cardiff has hosted seven of the top nine already, with the exceptions being third-placed Chelsea and fourth-placed Liverpool. So Cardiff should be quite pleased with having the 14th best home record. West Ham, on the other hand, does not have much in the way of excuses for its away numbers of one win, three draws and six losses. West Ham has yet to face Arsenal, Manchester City or Chelsea on the road but it has played three of the other five teams in the bottom six. Furthermore, West Ham has performed poorly, both at home and away, against sides below the fold. Only Sunderland has performed worse. Punters who believe that lightning can strike twice in the same place will be all over Swansea at odds of 8.50 with Coral to beat Manchester United at Old Trafford for the second weekend in a row. However, one should note at least two things. First, Manchester United won the reverse English Premier League fixture 4-1 thanks to two goals apiece from Robin van Persie and Danny Welbeck. Swansea’s goal, scored by Wilfried Bony, came when the game was over as a contest. 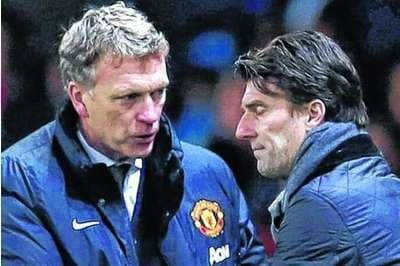 And second, Manchester United slipped up versus Swansea in the English FA Cup in large part because Red Devils manager David Moyes gambled on selecting a second-string line-up. Manchester United is going backwards at a rapid rate under Moyes because the Red Devils chose a proven loser to succeed a proven winner but it is unthinkable that Swansea, whose English Premier League form in recent weeks has been among the worst in the division, will win two consecutive matches at Old Trafford so steer clear of the long odds on offer.